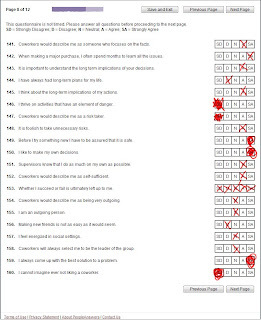 I just finished filling out a job application to a local art supply store. I've always thought working at this place would be fun, considering I'd get to smell the potpourri all day and play with fake fruit (those grapes look so GOOD!) in between some actual work-doing. But now that I know how intense the application process for this place is, let's just say I definitely hold much more respect for the current employees. Not that every other application I've filled out so far hasn't been in-depth or time consuming. I don't know how many time's I've had to enter social security numbers or old employer phone numbers or answer questions concerning violent and irresponsible behavior. But this application...this was just different. The initial process was fine. I entered my name, address, contact information, filled in tedious amounts of backround employment information, privately sifted through entertaining memories of said employment. But then, completely out of nowhere, I had to complete a timed 10-minute logic and math test. Suddenly a job requiring the ability to arrange flowers and know the difference between 2B and an HB pencils was asking me complex fraction/decimal math problems. Word associations were also thrown in the mix, like "Qualm is to Trepedation as _____ is to _____." I suppose I can see why they would want to do this. I mean, of course you wouldn't want to hire someone that has no idea how to do basic things, like...say...count change, alphabatize files, or know what the relationship between "Qualm" and "Trepedation" is. So after freaking out about getting as many answers shoved down the computer's throat in the span of ten minutes as I could (hey, just because I'm not great at math doesn't mean I can't stock yarn and modeling clay! ), I took a deep breath and calmly proceeded to the next section. 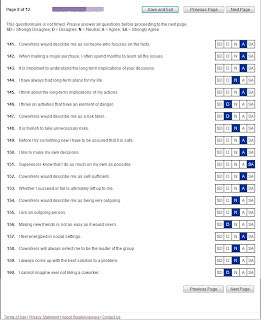 Pretty much every job application in America has some sort of section involving personality traits or tendencies that give the employer 'insight' into your mentality. It's always hard to tell where they're getting at with some of these questions, or even if they take them seriously. If you answer all of them with the obvious best choice, do they think you're a liar, or just a control freak? If you answer some of them negatively (or just plain honestly), will they appreciate your openness, or will they think you're too unstable for employment? Because of these questions running through every job hunter's head, you tend to be a little less specific with your answers in order to give the employer what you think they want to hear. ("Sell yourself!" As they always said in high school.) I took a screen shot to show you just what I mean. To see the full-res pictures, click on the links above the photos (In case blogger's dont work). Yeah, humans are too complicated to be able to answer such loaded questions with "Agree" or "Disagree", don't you think? Qualm is to Trepedation as Blank is to...oh, wait, how old am I again? YES, it was ACTUALLY there! What kind of cryptic question is "Qualm is to Trepidation as _____ is to _____" anyway? They gave you lists of words to fill the blanks in with. But still...on a job application? For a craft store?